GenreOnline.net: Batman: The Second Season: Part One DVD Set Review. Batman: The Second Season: Part One DVD Set Review. 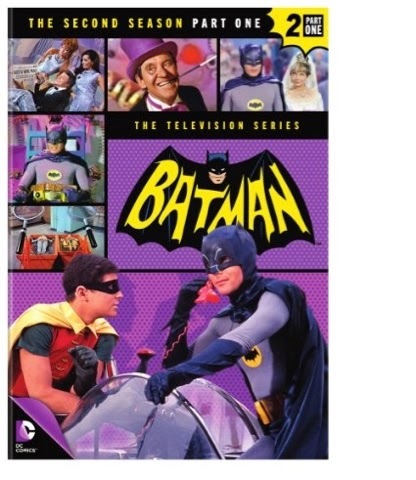 For nearly two decades, one of the most requested TV series to be released on DVD from the 1960s was the classic Batman, starring Adam West and Burt Ward as the caped crusaders Batman and Robin. The only item available legally on DVD and eventually Blu-Ray Disc was the 1966 feature film, Batman: The Movie, which released theatrically between the first and second seasons. Then in 2014 Warner Brothers Home Entertainment finally released the complete series on Blu-Ray Disc and DVD as well as Digital Copies in standard and high definition on iTunes and UltraViolet. The first season also was released on DVD separately, but many may have not noticed it at first because of the premium complete series sets that were offered first on Blu-Ray and DVD. With the holiday season proving to be a tight season financially for many consumers, those who could not purchase the deluxe sets containing the entire series were also in some cases unable to purchase the first season and or subsequently decided to wait and see how Warner Brothers would release the future seasons on DVD. Well I can tell you all now that if you have been holding off on the season sets on DVD, there is no reason to hold off any longer. The recently released Batman: The Second Season: Part 1 contains the first 30 episodes of the second season spread across four DVDs and they are beautifully packaged within a Four-Disc Single Sized Plastic Keep Case within a cardboard slip. I find the plastic packaging for both Blu-Ray Discs and DVDs to be preferable over the cardboard deluxe packaging some multi disc sets come within so if you are like me then you might choose to purchase the series this way. All thirty episodes look fantastic in their standard definition digitally remastered (1.33:1) television broadcast aspect ratio and even hold up just fine when up converted via HDMI to 1080p. An English Monaural Soundtrack is provided along with optional English, French and Spanish Language subtitles encoded across all four discs as options. There is also a beautiful full color episode guide insert within the DVD set Keep Case, which is refreshing because not all TV releases these days include episode guides and information. The effect Batman had during it's original run cannot be understated and it's legacy lives on too. Adam West and Burt Ward are arguably the best Batman and Robin team ever and serve as a litmus test since for all who have taken on the role regardless of the approach. Celebrities wanted to be on Batman to be a special guest villain or simply make a cameo appearance while the dynamic duo do their famous climb up a building wall. Guest Villains/Stars for these first 30 episodes of season two include Art Carney as The Archer, Julie Newmar as Catwoman, Van Johnson as Minstrel, Victor Buono as King Tut, Shelley Winters as Ma Parker, Walter Slezak as Clock King, Vincent Price as Egg Head, Liberace as Chandell, Burgess Meredith as The Penguin, Otto Preminger as Mr. Freeze, Cesar Romero as The Joker, Carolyn Jones as Marsha, Queen of Diamonds, and Cliff Robertson as Shame. An outstanding addition to any fan's Batman collection, Batman : The Second Season: Part One is available now at retailers on and offline courtesy of Warner Brothers Home Entertainment.